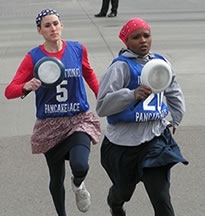 Photographs of Pancake Day, going back for more than 60 years, are an important part of this area’s unique history. The International Pancake Day Board is currently accepting bids for a photographer to cover Pancake Day events in Liberal, Kansas. Pancake Day is March 4, 2014, and related events will begin the Saturday before the big day. The photographer will be responsible for attending and photographing all events and must provide his or her own professional quality digital camera. Bids will be accepted through Dec. 20, 2013, or until a photographer is selected. Complete specifications are available on the Pancake Day website, www.pancakeday.net, or on the International Pancake Day Facebook page. Interested photographers may also request a copy of the specifications or more information by calling JoAnn Combs at 620-624-6423.